With some key healthy ingredients on hand, its easy to put together meals when you get home from work. These ideas are so easy, even a bachelor can do it! 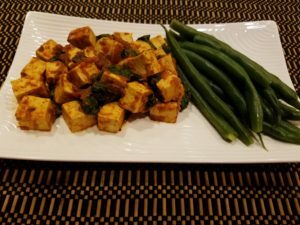 I created these meal ideas along with grocery lists and a few recipes for a male client who doesn’t know how to cook and was very intimidated with the thought of putting together healthy meals. He loves it and not eating out every night or relying on frozen pizza is helping him reach his health goals. Below are idea combinations, but feel free to mix and match. 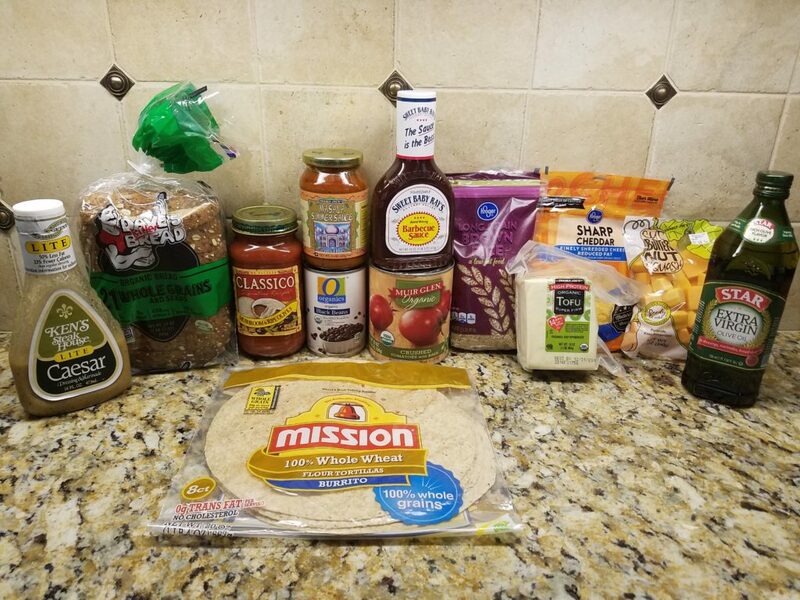 Scroll down and I give you a grocery list, a Trader Joe’s Grocery list, a list of my favorite whole grain cereals, best-tasting low-cal salad dressing and a few simple recipes. To make it even easier, print this post out now. Make copies of the grocery lists and stash all this info in the kitchen for reference. Any ingredients you need to make the salads below. Deli Turkey or Chicken no preservatives, without nitrate or nitrite, also called natural. Boars Head a good brand. Roasted Broccoli You can use this method for cauliflower, butternut squash, or carrots. Time to cook will be different. Preheat oven to 425 degrees F. Cut the broccoli florets into bite size pieces. Cut the stalk into 1/8-inch thick, round slices. Place the broccoli into a mixing bowl and toss with the olive oil, salt and pepper and set aside. Put broccoli on a foil lined baking sheet and place in the oven and roast just until the broccoli is tender, 8 to 10 more minutes. Remove from the oven, toss in the cheese and serve immediately. Prepare 1 1/2 to 2 pounds of fresh green beans by snapping them or cutting them to approximately 1 inch in length and rinsing them. Place 1 inch salted water in a large pot. Add green beans, cover, and bring to a boil. Cook until green beans are tender to the bite about 15-20 minutes (depending on how crisp you like your cooked green beans). Drain into a colander. Wash and poke a couple holes in a baker (russet) potato. Microwave until soft. Cut in half and top with 3/4 cup canned, drained black beans or chili. Top with 3 Tbs 2% reduced fat sharp cheddar, put back in the microwave to heat the beans and melt the cheese. Top with salsa. Brown 4 skinless, boneless chicken breasts cut into cubes and 1 small chopped onion, in an oiled skillet over medium. 1 can Italian style stewed tomatoes. Cover and simmer 5-7 minutes. Serve over cooked whole grains. In a bowl, separate the eggs discarding 3 of the yolks. Beat eggs, water, salt, and pepper until frothy. In a small sauté pan, cook vegetables. Wipe oil onto the bottom of a large nonstick skillet. Pour in eggs and cook covered, over medium heat, 6 to 7 minutes until bottom is lightly browned and top is set. Spoon hot sautéed veggies over half the omelet, and then gently slide it out of skillet onto platter, folding the half without filling over bottom half. Sprinkle top with cheese. Preheat the broiler and combine ½ tbsp. honey with ½ tsp. soy sauce. Season 1 5-oz. salmon filet with salt and pepper and broil for five minutes. Drizzle with honey-soy sauce and broil an additional 2-5 minutes. Chopped Pecans, Chopped Apple, Feta Cheese Crumbles, Pomegranate Seeds, on a bed of fresh greens served with a low-fat Vinaigrette Salad Dressing. Grilled Chicken Breast, Bbq Sauce, Chopped Romaine Lettuce, Black Beans, Cubed Jicama, Pumpkin Seeds Corn, Diced Tomatoes and Red Onion. Serve With Lowfat Or Reduced Fat Ranch Dressing or Cilantro Dressing. Grilled Chicken, Shrimp or Flank Steak, Chopped Romaine Lettuce, Sliced Black Olives, Black Beans, Red Bell Pepper, Chopped Fresh Cilantro, Reduced Fat Sharp Cheddar Cheese, Cubed Jicama, Corn, Pumpkin seeds, Diced Tomatoes and Red or Green Onion and Tortilla Chip Strips. Serve With Lowfat Or Reduced Fat Ranch Dressing mixed with some Chipotle in Adobe or Cilantro Dressing. Warm Sautéed Shrimp on a Mound Of Crisp Mixed Greens, Sliced Strawberries, Raspberries And Blueberry With A Crumble Of Goat Cheese. Sautéed Chicken Breast, Sautéed Onions, Garlic And Red Pepper Strips Served Atop A Generous Mound Of Crisp Mixed Greens, Reduced Fat Sharp Cheddar, Black Olives, Salsa, Reduced Fat Or Fat Free Sour Cream And Avocado Cubes. Crisp Mixed Greens (Your Choice Of Spinach, Romaine, Red Leaf) Carrots, Red Cabbage, Tomato, Cucumber And Thinly Sliced Red Onions. Add Cooked Shrimp, Chicken Or Salmon. Serve With A Reduced Fat Balsamic Vinaigrette. Fresh Crisp Chopped Romaine Lettuce Tossed With Reduced Fat Caesar Dressing And Shredded Parmesan Cheese. Top with Grilled Chicken, Shrimp Or Salmon. Grilled Chicken Breast, Berries (Blueberry, Blackberry, Raspberry Or Strawberry), Low Fat Feta Crumbles, Toasted Chopped Walnuts Served Atop A Generous Mound Of Mixed Greens. Serve With A Reduced Fat Balsamic Vinaigrette Or Raspberry Vinaigrette. Crisp Mixed Greens, Small Cooked Shrimp Or Chopped Cooked Chicken, Chopped Hard Cooked Egg, Avocado, Tomatoes, Black Olive Slices And Chopped Red Onion, Chives Or Green Onion, A Smidge Of Crumbled Roquefort Or Blue Cheese With A Dijon Red Wine Vinaigrette. Spinach, Sliced Mushrooms, Mandarin Oranges, Toasted slivered almond, red onion rings tossed with a sweet vinaigrette. Here are my favorite bottle salad dressings.  Nature’s Path Optimum 1 cup has 190 calories, 10 whopping grams of fiber, half the sodium as Wheaties, 16 grams sugar, 200 mg sodium.  A kid friendly cereal is Barbara’s Puffins which has flavors from cinnamon to peanut butter, and is rich in whole-grains and fiber, low in salt and added sugar and free of artificial flavor and color enhancers.  Uncle Sam has 237 calories, 11 grams of fiber, 6 grams of fat, 1 gram of sugar for a large 55 g serving.  Kashi’s Heart to Heart in a ¾ cup has 110 calories, 5 grams of fiber, 5 grams sugar, and only 90 mg sodium.  Erewhon Crispy Brown Rice is gluten free (for those who have celiac disease), 110 calories, half a gram of fat and 1 gram of sugar for a 30 gram serving.  Bob’s Red Mill Meusli is gluten free (for those who have celiac disease), 110 calories, 3 grams of fat, 2 grams of fiber and 5 grams of sugar in a 29 gram serving.  Kashi Autumn Wheat has 180 calories, 1 gram of fat, 6 grams of fiber and 7 grams of sugar for 29 biscuits.  Kashi Simply Maize corn cereal contains 100 calories, 1 gram of fat, 2 grams of fiber and 6 grams of sugar for ¾ cup.  Whole Grain TOTAL contains only 97 calories, 1g of fat and 5g of sugars per 30g serving.  Frosted Mini-Wheats original Kellogg’s. A 30g serving of the original kind contains only 102 calories, less than 1g of fat, 3g of fiber, 6g of sugar, and 3mg of sodium.  Cheerios. A 30g serving of plain Cheerios contains 111 calories, 2g of fat, 4g of fiber, and 2g of sugar. The only snag is that they are slightly high in sodium with 213mg of sodium.  Post Grape-Nuts Flakes. A 30g serving of flakes has 106 calories, 1g of fat, 3g of fiber, 5g of sugar, and 140mg of sodium.  Kellogg’s Complete Wheat Bran Flakes have 92 calories, 6 grams of fat, 5 grams of fiber and 5 grams of sugar in a 29 gram serving. Even healthy foods can pack in a lot of extra calories and make you gain weight. Salads particularly can be deceiving. It appears they are healthy but some can be higher calories and fat than a Big Mac. 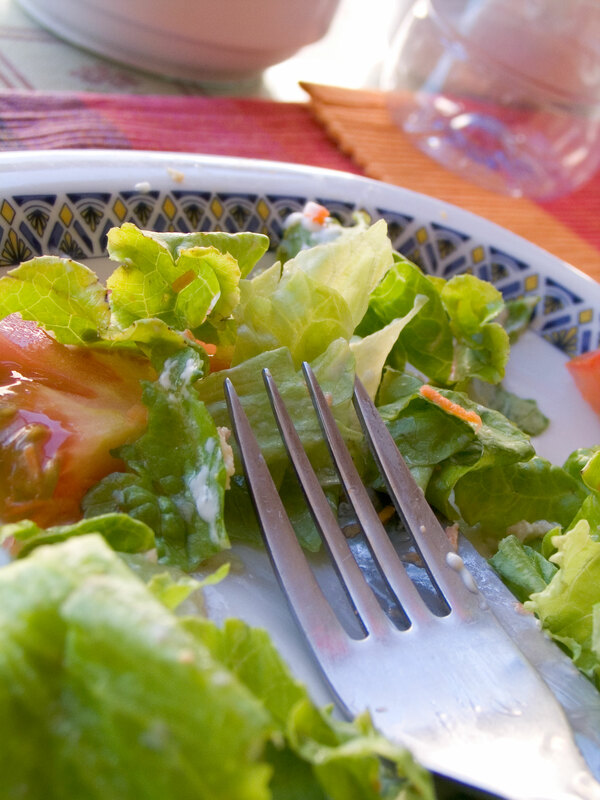 To keep your salads healthy, resist high–calorie extras such as cheese, nuts, bacon, and full-fat dressing. Take a look at the nutrition content of my client’s chicken salad and whole grain roll lunch compared to a Big Mac. Her salad has more calories and more fat. All because of the dressing.